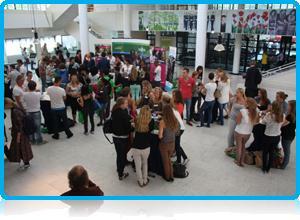 In 2010, the first steps of creating a student community in Apeldoorn were taken by several students from Wittenborg University of Applied Sciences, Saxion Hogeschool, and the Theologische Universteit, in partnership with the Education Platform Apeldoorn (‘het Onderwijs Platform’). Nearly three years later, these ideas have begun to take shape. With the launch of the “Whatsapeldoorn” website, a platform for and by students, and the issuing of the Apeldoorn Student Card a few months later, the community for students in Apeldoorn is becoming a reality. The new ‘Whats Apeldoorn Card” gives all students in Apeldoorn the opportunity to benefit from student discounts at local Cinemas, Restaurants, Gyms and even Beauty Salons. With the launch of the “Whatsapeldoorn” website, a platform for and by students, and the issuing of the Apeldoorn Student Card a few months later, the community for students in Apeldoorn is becoming a reality. The new ‘Whats Apeldoorn Card” gives all students in Apeldoorn the opportunity to benefit from student discounts at local Cinemas, Restaurants, Gyms and even Beauty Salons. A full list of participating business can be found at the website www.whatsapeldoorn.nl. Developed and managed by CvJO Apeldoorn, an organization for young entrepreneurs, the goal of whatsapeldoorn.nl is to create a real-life community for students. In order to achieve this goal, the first step is to bring students together and nothing brings students together better than a student party. The preparations for this event are in full swing. With the mission of making the student community a sustainable aspect within the Apeldoorn region, CvJO and the Education Platform Apeldoorn are integrating student bodies from all higher education in Apeldoorn. Wittenborg’s Student Representative Group is one of the bodies that will play a role in this long-term project. Beginning next month, they will start taking an active role in communicating and generating ideas and wishes from students as well as promoting and advertising the importance of a student community in Apeldoorn. - Nicky van Riggelen, Final Year IBA student in Marketing & Communication.